When I travel I like to bring with me two or three projects to work on during downtime. For this trip (I am in Brazil visiting family) I am knitting socks, a scarf, and doing English paper piecing. When I don't feel like knitting, I can hand sew. 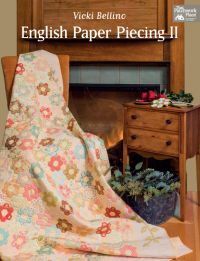 English paper piecing is ideal for using scraps of fabric, which can be conveniently packed in small bags for traveling. As usual with English Paper Piecing for me, I have no idea what I will do when I have all the pieces prepared. I spent some time this morning thumbing through Vicki Bellino's English Paper Piecing II for inspiration and was totally blown away by her cool projects. Wall hangings, cover ups, bed runners, totes... each project showcasing hexagons, diamonds, scallops and other interesting shapes used very creatively. Aren't these gorgeous? Vicki loves paper piecing and it shows... Whether you already love EPP or always wanted to try it, this book is a great choice. The general instructions at the beginning of the book are very detailed with clear diagrams, a useful resource for beginners and experienced paper piecers alike. Well, time to go for a walk and be inspired by nature. Enjoy your day!